In a similar manner to Up, Riley's first 11 years hurtle by in a matter of minutes. We meet her again in a transitional period as her family move from Minnesota to San Francisco and things in the brain hub start to go awry. Joy and Sadness embark on a perilous mission to save the day, travelling through a detailed, imaginative landscape which crumbles as Riley’s growing pains increase. Amy Poehler assumes her Leslie Knope persona from Parks and Recreation as she voices the super positive and organised head of the group Joy. When Riley's mother (Diane Lane) asks her daughter to keep her chin up, Joy does not want to let her down, but in her determination forgets that each emotion is just as important as the others; something that Sadness (voiced by a perfectly cast Phyllis Smith, channelling Beetlejuice's Lydia Deetz) constantly attempts to communicate. While Mindy Kaling as Disgust is straight outta Mean Girls, and hilarious to boot. Highlights include the introduction of Riley’s imaginary friend Bing Bong (Richard Kind) who is part elephant, cat and dolphin, and an abstract sequence which skips between modern art movements in a gloriously manic fashion. Co-director and writer Pete Docter has said he was inspired to make Inside Out after he witnessed his daughter going through a tough time. You can tell; every gag and sentiment rings entirely true. Screening as part of Cannes 2015. General release from Fri 24 Jul. Riley (Dias) is an 11 year old girl whose family is moving from Minnesota to San Francisco; her troubled mind is represented as a factory hub commanded by Joy (Poehler), Fear (Hader), Sadness (Smith), Disgust (Kaling) and Anger (Black). 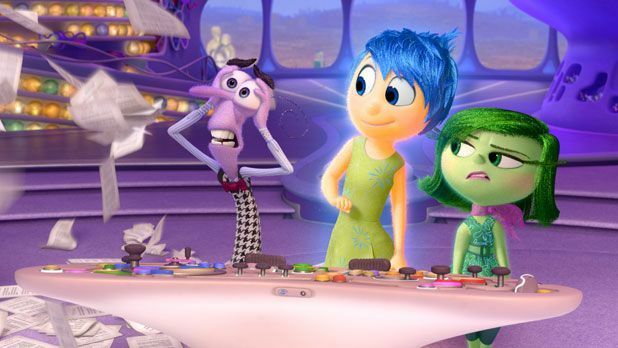 Delightful, poignant and hysterically funny coming-of-age story from Pixar.